Just ahead of the premiere of Justin Kurzel’s Assassin’s Creed movie next week, 20th Century Fox has released a new movie clip showing an exciting action sequence from this upcoming movie. And judging by this short clip it looks like director Justin Kurzel could have successfully captured the magic of the Assassin’s Creed games, plus we also get to see Michael Fassbender’s character Aguilar perform the iconic “leap of faith” seen in the video games, jumping from a scaffold at the end of the clip. There’s one aspect of how this sequence is shot that might ruin the atmosphere of the movie’s 15th century Spain setting, though, and it’s the way the action sequence set in the past is intercut with scenes of Fassbender’s modern day character Callum Lynch performing actions in the Animus, the machine that allows him to relive the memories of his ancestor Aguilar. It wasn’t like this in the games, and takes away some of the momentum of the action sequences set in Spain, although some may consider this an interesting stylistic choice by the director. 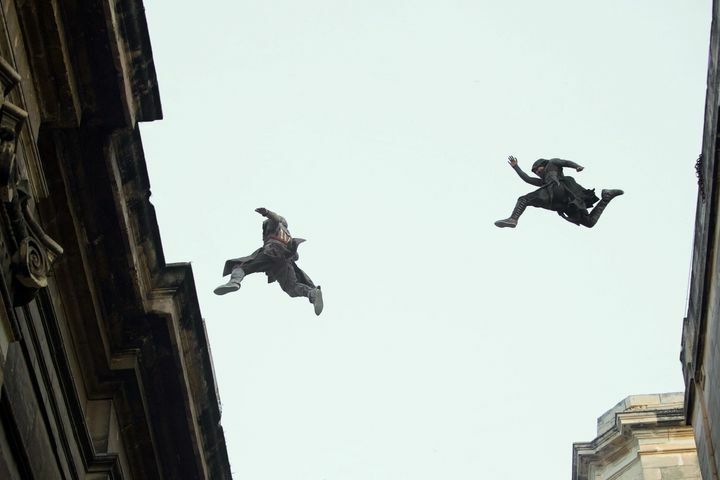 It can’t be denied, though, that the leap of faith looks terrific in the movie, and interestingly this is not the result of CGI effects but an actual stunt, which wasn’t performed by Michael Fassbender himself though… Because even though most actors in the movie did their own stunts (which resulted in a few bruises and broken bones too), it was stuntman Damien Walters who jumped from a height of 125 feet (about 38 metres), in one of the most impressive free fall stunts in 35 years, as seen in the video below. It’s a good thing that this Assassin’s Creed movie is relying more on practical effects than CGI too, as this will surely add an air of authenticity to the proceedings, and perhaps help the film break the video game movie curse and end up becoming the first successful movie based on a video game property, also making up for the fact that Assassin’s Creed fans won’t get to play a major game in the series this year. Will The Walking Dead: A New Frontier be as good as the earlier seasons?